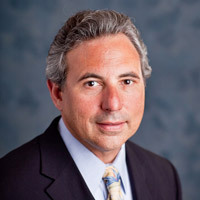 Dr. Joseph Pisegna is Professor of Medicine at UCLA and Chief of the Division of Gastroenterology and Hepatology in the VA Greater Los Angeles Healthcare System. Dr. Pisegna is interested in the molecular pharmacology of hormones and receptors in the gastrointestinal tract, especially the diagnosis and management of islet cell tumors of the pancreas, including the Zollinger-Ellison Syndrome. These research and clinical interests derive from research in the biochemistry and physiology of neuroendocrine tumors. While a fellow at the National Institutes of Health, Dr. Pisegna first developed a clinical interest in the Zollinger-Ellison Syndrome (ZES), where he discovered and cloned the receptor for gastrin and named it the cholecystokinin B receptor. More recently, Dr. Pisegna has demonstrated that receptors for gastrin are present in the kidney and mediate food-induced regulation of salt excretion. Dr. Pisegna was recruited to the faculty at the University of California, Los Angeles and the Center for Ulcer Research and Education (CURE) in 1996. He is a recipient of the VA Career Development Award at the West Los Angeles VA Medical Center. His addition to the faculty of the UCLA Center for Pancreatic Diseases provides unsurpassed expertise in the diagnosis and medical management of pancreatic endocrine tumors. Dr. Pisegna’s main research interest is the molecular pharmacology of hormones and receptors in the gastrointestinal tract. These research and clinical interests derive from research in the biochemistry and physiology of neuroendocrine tumors as well as an understanding of the molecular interaction of peptide hormones and their receptors. His clinical efforts are currently focused on the management of gastric hypersecretory conditions, neuroendocrine tumors of the GI tract, and Zollinger Ellison Syndrome (ZES), medical conditions that derive from alterations in the expression of gastrointestinal hormones. Dr. Pisegna cloned the receptor for pituitary adenylate cyclase activating polypeptide (PACAP), which is in the vasoactive intestinal polypeptide family of peptides and the calcitonin gene related peptide (CGRP). He has demonstrated that PACAP is a potent stimulant of gastric acid secretion and is expressed on neurons innervating the stomach, with enterochromaffin-like cells (ECL) of the stomach expressing receptors for PACAP. Using mice lacking the PAC1 receptor, he has demonstrated that the mice develop a gastric acid hypersecretory condition resulting from hypergastrinemia. Recently developed VIP knockout mice have been demonstrated to have abnormal gastrointestinal motility. More recently Dr. Pisegna's research interests extend to understanding the mechanisms involved in satiety with a research focus in treating obesity disorders.